Debate Heats Up About Contentious Bird Flu Research : Shots - Health News Because of fears that lab-altered bird flu viruses could cause a deadly pandemic if they ever escaped the lab, scientists agreed to a moratorium on mutant H5N1 flu research eight months ago. Now top scientists in the field continue the debate about the work, publishing six commentaries for and against the end of the moratorium. 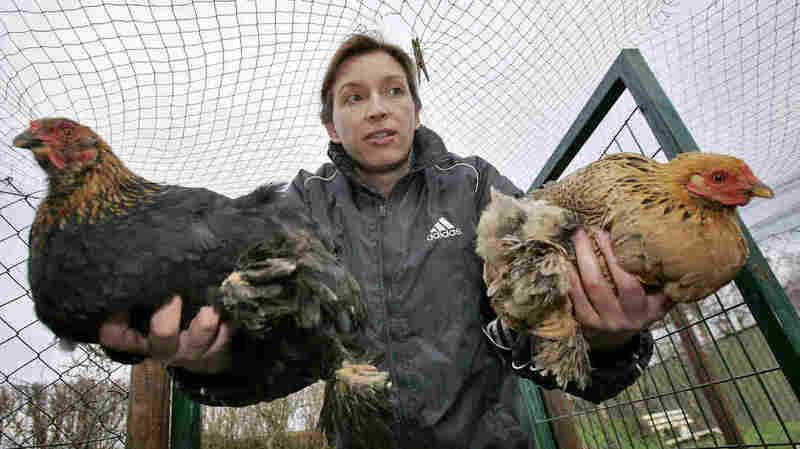 When a case of the potentially lethal H5N1 bird flu was found in British poultry in 2007, Dutch farmers were told to keep their poultry away from wild birds by closing off outdoor areas with wire mesh. What was supposed to be a 60-day moratorium on certain experiments involving lab-altered bird flu has now lasted more than eight months. And there's no clear end in sight. Researchers still disagree on how to best manage the risks posed by mutant forms of highly pathogenic H5N1 bird flu. The altered viruses are contagious between ferrets, which are the lab stand-in for humans. The fear is that these germs could potentially cause a deadly flu pandemic in people if they ever escaped the lab. The journal mBio has now published six commentaries from key players in the debate. One of them is Dr. Anthony Fauci, director of the National Institute of Allergy and Infectious Diseases, which funded the controversial work. He writes that the U.S. government is planning to host an international workshop before the end of the year to consider whether certain experiments on H5N1 should be conducted at all. The researchers' voluntary moratorium, Fauci writes, "is providing us the time and space we all need to work together and get this right, and it should be continued until we do so." Others disagree. Virologist Ron Fouchier, whose lab at Erasmus Medical Center in the Netherlands made mutant forms of H5N1, tells NPR via email that, to his knowledge, no one has restarted work. But he has spoken with many scientists who don't favor continuing the self-imposed pause. "We are constantly discussing the issues," says Fouchier. "When it became clear that mBio was going to publish some commentaries, we decided to wait for that to read about the other opinions." But he says he sees no new arguments in those commentaries that would justify continuing the moratorium. "We will now have to see what the other investigators that signed for the original pause are now thinking," says Fouchier. Fouchier believes studies on how H5N1 bird flu can become transmissible in mammals are essential to prepare for the possibility of a naturally occurring flu pandemic. One key issue that's still unresolved is whether any future research with these viruses would need to be done at a higher level of biocontainment and lab security. A U.S. government committee is expected to make its advice on this public any day now. From the Harvard School of Public Health, Marc Lipsitch and Barry Bloom argue in their mBio commentary that H5N1 viruses that are transmissible between mammals could pose "a greater threat to public health than possibly any other infectious agent currently under study in laboratories, because of such viruses' likely combination of transmissibility and virulence to humans." In their view, work on these viruses and other pathogens that could potentially cause pandemics "must be limited to the most pressing experiments in a limited number of competent laboratories."